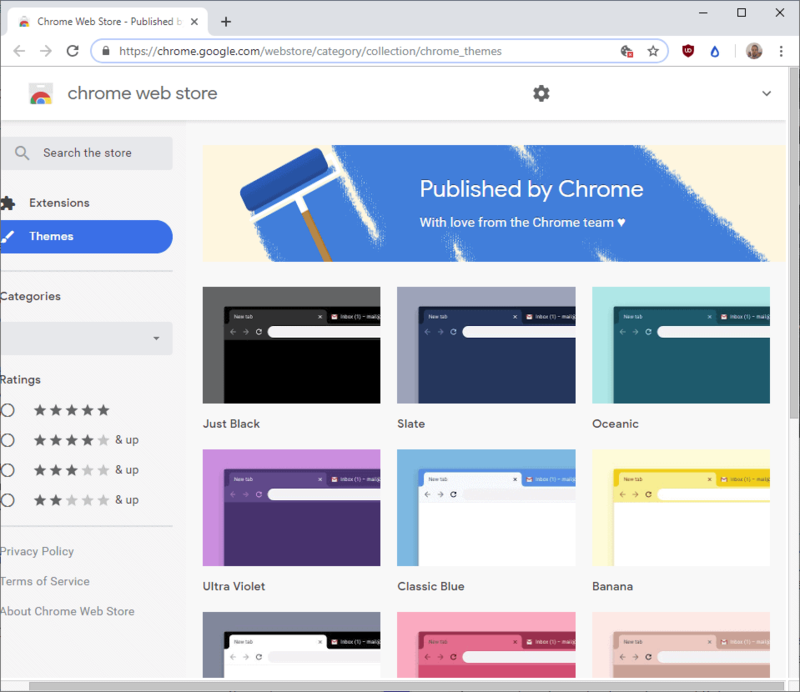 Google published a new themes collection for the company's Google Chrome web browser recently that come directly from the Chrome team. Google Chrome's theming capabilities were limited right from the start. While that made it super-easy for anyone to create themes for the browser, all they did was change a couple of colors in the user interface, it meant that themes were seriously limited in what they could offer. Firefox's classic theming capabilities were more powerful than that. Firefox themes, full themes to be precise, could change any browser element and remove or add interface elements next to that. Mozilla did drop support for full themes with the release of Firefox 57 and Firefox's capabilities in that regard have moved closer to Chrome's even though they are still more powerful than what Google Chrome offers. Google's Chrome browser comes with theming support but only a single theme; this will change in the near future for Chrome on Windows 10 as it will support the operating system's dark theme mode natively. The same is true for Chrome for Mac OS X 10.14 or newer as dark mode support will be introduced as well. Chrome users can visit the official Chrome Web Store to install themes in the browser. The theme section of the store divides themes into different groups, e.g. minimalist themes, enchanting places, or space exploration. The main differentiator is the New Tab Page background image that theme may come with, and a different UI color scheme. You may access Google's official list of Chrome themes that were designed by the Chrome team here. The themes paint Chrome's user interface in different colors but they all come without background images. One of the themes paints the entire interface in dark colors, others offer more colors or high contrasts instead. Installation is pretty straightforward. Just select any of the themes you are interested in and click on it to open its page on the Chrome Web Store. Click on "add to Chrome" to install the theme in Google Chrome. Chrome won't display an installation dialog for themes, but it will display a notification bar at the top that indicates to the user that a new theme was just installed. The bar includes an undo option to remove the theme again. Google Chrome does not list installed themes on the extensions management page of the browser. You need to go to chrome://settings/ for an option to reset the theme to the default. In short: you cannot install multiple themes in Chrome: it is just one theme and the default theme at all times. 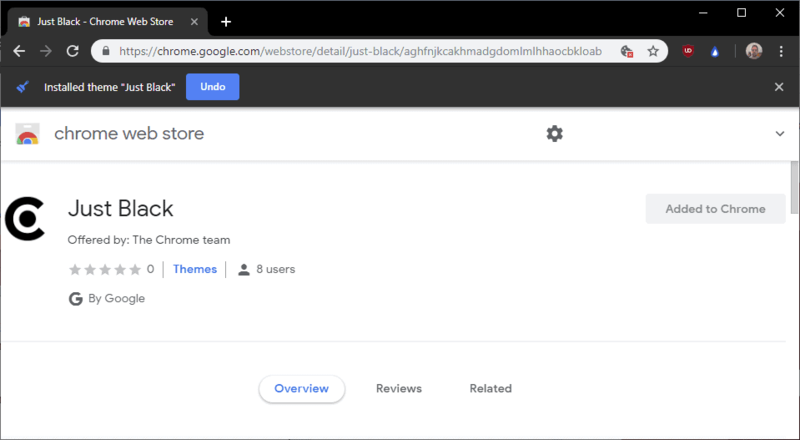 Google highlights these new official themes on the main themes page on the Chrome Web Store; this alone will surely lead to great exposure and lots of installation by Chrome users. Now You: do you use custom themes in your web browser of choice? The Classic Blue that is featured is the wrong one. For a few years I have been using “Black metallic theme”, with a custom background for Gmail. To me it is close to a perfect choice for Chrome. I intended to also mention the new version of the Chrome extension for New Tab by Google. Firefox is generally looking better designwise than Google Chrome. One reason I chose Firefox over Chrome. Always. It makes the different user profiles from Brave easier to identify. Not many themes available right now but very nice colors nonetheless. Still wish Chrome was more customizable like the Vivaldi browser but oh well. Flat and ugly….that is the trademark among corporations today ! I installed the black & white theme. Black tab bar and white adress bar. I looooveee it!! !